As a gym owner or program director, you have a lot on your plate! So we’re giving you some of our favorite free and low-cost resources to help you be more efficient, organized and profitable in your all-star cheerleading career. (This is Part 2 of this article, so if you missed Part 1, be sure and grab all the cool resources there, too.) These articles are not an advertisement for any listed company or app. It is simply of listing of the tools our consulting clients love the most—and that we love the most—to help you grow your gym. Evernote: Welcome to productivity and research heaven! Evernote makes it easy to remember things big and small from your everyday life using your computer, phone, tablet and the web—putting notes, web clips, and images available in one place. Collaborating online with coaches, vendors and staff is a snap with this tool, and it’s awesomely free. (Upgrades available). Trello: Trello is another free productivity and collaboration tool that organizes your projects and ideas into boards. In one glance, Trello tells you what’s being worked on, who’s working on what and where something is in a process. Like Evernote, it has mobile apps to keep you informed on the go. Look at both programs and decide based on your personal preference if you want to use both or just one of these very cool platforms to help you and your team run smoothly and stay accountable to all that needs to be done. SignUpGenius: Here is an awesome one for team moms and your booster club: this site allows you to create forms and then invite others to sign up and pitch in! Need items for the goodie bags? Just make your form here and invite them to sign up for what they want to bring. It has many uses, and the basic version is free! Google Calendar: Your gym calendar should absolutely be online accessible. Google calendar allows for multi-user sharing and editing with great control over who sees what. Color coding allows for easy organization and visual attention to specific items. Because it’s web-based, you always have it! Google calendar allows you to sync with your other existing calendars easily, such as iCal or Outlook. Yes, it’s free. If you don’t already have a Google account (Gmail, YouTube, G+, etc), just go to google.com and sign up. Then click “calendar” and watch your productivity go way up. iClass Pro: If you want a more streamlined vehicle to manage your classroom signups, payments and communications via your website platform, this is a great resource. It’s your all-in-one manager for all things class and team related. One of our favorite features here is broadcast text or voice communications for your teams, which is fantastic for on-the-go communications while at competitions or other emergency notifications that your gym families must hear. (ex: “Team Jaguars, our competition time has been changed to 3:23pm. Please meet up at Section 110A by the blue doors 20 minutes earlier than the email notice last night!”). This system offers a free 30-day trial and is priced at $129/month for a single facility thereafter. WordPress: This website platform was originally created to help bloggers easily build their websites. WordPress is one of the smartest and easiest (and free) platforms to build your entire cheer website, even if you do not have a blog. (Although you should, and that’s an entirely different post.) The simplicity of WordPress makes it easy to set up, edit your site, add pages, posts and pics…all without needing to wait on (or pay for) a web developer! If you get stuck, though, WordPress is such a common framework, that you can easily find by-the-project contractors to help you on Elance or Odesk, which we discussed in part one of this article. BlueHost: There are many hosting companies out there, but we recommend this one because they have by far the most reliable service we’ve seen over the years. You can get unlimited email and storage, and prices start as low as $4.95. Bluehost also offers a huge benefit: a very simple one-click system to add your WordPress site, complete with super-easy video tutorials. This alone can save you several hundred dollars by not having to hire someone to add your WordPress to your domain. Full disclosure here—if you do sign up for Bluehost by using this link, we may receive an affiliate commission for referring you. We are transparent about that. But we really do recommend Bluehost because we love it and use it ourselves. Your own YouTube Channel: Having a YouTube account is different than having a YouTube Channel for your gym. It’s free to make one and will help you drive your brand in big ways, since YouTube is such a dominant search engine. Simply log in to your account, then create your channel by naming it, adding your logo and company descriptions, as well as links back to your site. We suggest naming your channel the same as your Twitter name or website when you set it up. Also, when you begin uploading your videos, place your website link with the complete http:// in the description first, before you start typing what your video actually is. This prevents the link from being cut off in the description section and helps you drive traffic back to your site, which is really the goal in most cases. It’s been a joy sharing with you. We consider it a privilege to help build leaders in the cheerleading industry. Stop by and say hello if you run into us during competition season, or stop by our site to learn more about how we can help you in your gym. Identical twins Aly Calvo and Andrea Kulberg, M.Ed are leadership development experts and consultants for the cheerleading industry. 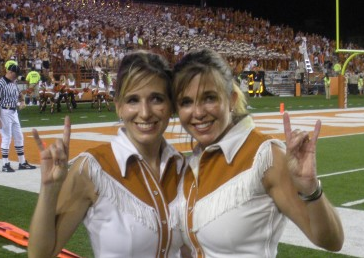 They are former University of Texas cheerleaders, and former NCA Staff. Andrea is one of the founding partners of a major international event producer, served as the International Representative for the USASF Board of Directors, and is in the USASF Hall of Fame. Aly and Andrea together have been named among the best business coaches in the country and among the “Top 50 Women to Follow on Twitter.” Now, they help coaches, gym owners, and parents have extraordinary experiences within the cheerleading community via their online training, mentorship programs, live events and competitions. For more information about Aly & Andrea, click here or find them on Facebook or Twitter. To request a free consultation for your gym, click here.